A food service establishment is only as good as its restaurant equipment. Danvers restaurant owners can rely on United Service Co. for a wide range of services regarding critical commercial appliances. From ovens and fryers to walk in coolers and ice machines, our company does it all. We are your one-stop shop for professional repairs, maintenance, inspections, upgrades, and new installations. We even partner with U.S. Cooler to offer custom-designed coolers and freezers to local restaurants. Learn more. We’re confident we offer the equipment services you need. Whether you’re opening a new restaurant or need to replace old restaurant equipment in Danvers, United Service Co. has you covered. Our full-service company takes care of equipment sales, distribution, and installations. We work with top brands like U.S. Cooler and others to provide high-quality options to our customers. Our trained technicians won’t only install the piece you request – they can also help you select the ideal model, size, and type of equipment for your specific requirements. When you need new restaurant equipment in Danvers you can trust, come to United Service Co. We have more than 100 years of combined experience in the industry and enough knowledge to answer any question or concern you may have as a restaurant owner or equipment buyer. We sell only the most dependable ovens, fryers, coolers, ice machines, and other appliances. We know commercial and industrial equipment isn’t cheap. You should look for an option that will give you the most return for your investment. The best ROI means the best performance, greatest energy efficiency, and longest life span. While preventative maintenance and professional repairs can help keep your system in shape, your initial purchase goes a long way toward making your appliance a success. Our company sells restaurant equipment in Danvers that is affordable, reliable, and efficient. You can rest assured you’re putting your money to good use when you invest in new equipment through United Service Co. Stoves and ovens. We excel in services involving commercial stoves, ovens, ranges, and cooktops. These powerful and versatile pieces of cooking equipment require professional care and attention. In applications that involve high temperatures, you can experience wear and tear over time. We can clean, repair, replace, and recalibrate your cooking appliances for optimal performance. Deep fryer on the fritz? United Service Co. can help. We can troubleshoot a fryer malfunction and make repairs quickly, avoiding an interruption to your restaurant. In most cases, problems with commercial fryers are fast and simple to repair. We will inspect your gas valves, thermostat, thermopile, and other fryer components for issues and recommend the most appropriate solution for you. If your steam table stops working, you could run into numerous food preparation problems. Avoid cold food and an inefficient kitchen with fast repairs from United Service Co. We understand steam tables and can fix almost any type or brand. We recommend preventative maintenance to keep steamers from falling into states of disrepair. Schedule this service. Exhaust hoods. These heavy pieces of restaurant equipment in Danvers can break down without warning, leading to a smelly, hot, and improperly ventilated kitchen. Keep your cooking environment clean, aromatic, and free from problems with professional exhaust hood maintenance and repairs. We also provide new exhaust hood installations throughout New England. Makeup air systems. Your makeup air unit is the heart of your commercial kitchen. It’s what balances air intake and removal. The makeup air component is an integral part of your ventilation system and deserves top-quality repairs and services. Our team can repair broken units, clean air supply filters, and schedule preventative maintenance to keep your system in ideal working order. Ice machines. Did you know the ice machine is often the first piece of restaurant equipment in Danvers to fail a health inspection? Dirty ice can give you a poor health and safety rating and harm your reputation in the local community. Trust United Service Co. to clean and repair your ice maker, allowing you to provide the cleanest ice in town. Walk in refrigeration units. We specialize in reach-in and walk in coolers and freezers. Keep your food items and ingredients at regulation temperature with help from our technicians. Properly maintained units can help you avoid food spoilage, food poisoning, and liability for customer illnesses. Our team also offers walk in cooler/freezer sales, installations, and custom designs. Don’t see the piece of equipment you’re looking for? Don’t worry – this list is not comprehensive. Reach out to us to request information about a specific piece of restaurant equipment in Danvers. We service virtually all gas, electric, or steam equipment. With just one phone call, we can quickly and easily provide repair or replacement services at your New England location. Our technicians are sure to have the knowledge, training, and tools to complete the job you require. We are experts in all things commercial equipment. It’s amazing what the right team of servicemen and women can do for your restaurant equipment. 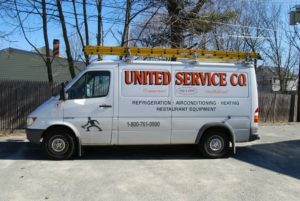 Danvers business owners can count on United Service Co. for top-quality installations, maintenance, and repairs. We know what it takes to optimize the performance of commercial appliances and want you to experience above-standard operability. Your best equipment is just a phone call away. At United Service Co., our family owned business truly cares about each customer who chooses us for commercial services. Let us meet and exceed your expectations on your next service call, and reap all the benefits of high-functioning, reliable, and efficient restaurant equipment. Danvers residents can call (800) 761-0900 to schedule services today.